At this time we, (the Angels) would like all to know that you are much too hard on yourselves. If you wonder why people are walking around today with low self esteem or committing harmful acts, yes part is from childhood experiences, but the rest is on your own shoulders. We see you all in love. It does not matter your physical appearance or your wardrobe. Please go deeper, for at a soul level we are all the same which is made in love. There is not a one of you who deserve the way you speak to yourself when it is so harsh. You need to begin to listen to the words you use when referring to yourself. This includes the thoughts you think when you are alone and checking yourself in the mirror before beginning your day. Listen to your quiet thoughts too, for if what you say comes back to you, don’t you want it to feel good? © www.theangelspath.com ~ Please include this info when reposting, thank you. Again, we are honored to be speaking with all of your sacred souls. We know that this is a trying time for all of you in terms of relationships and financial circumstances. You need to know this, for each time you struggle there will be a rainbow of sorts at the end of your grief. Back to the point, we do not interfere until we are called to action. When that happens we are glad to be of service to you but you must “pick up the phone”. This time of struggle will be proceeded by a time of rest as you on the earth at this time will be needing it. Please try to remember that you are experiencing this period of fear to get back to your roots. It is the people in life that make you, not the commercialism. A new Lexus will not get you to your final destination point, a heart that connected with others on earth will. So for now take a breath and acknowledge those around you that support you every day. If you do not have others in your life then this lesson, struggle, is meant for you, for how happy can you be in a house all alone? Thank you for listening and we hope it will not be so long until we have the privilege of speaking to you again. Welcome to a new month with new agendas on our mind. At this time we would like to impress upon you all to take time during each and every day to breathe. This is of vital importance. As you on the earthly plain see it, breathing keeps you alive. This in and of itself is important, but as we (being of another dimension) see it, breathing is how we impart our knowledge onto you. When you breathe, as in slowing down during each and every day and notice your breath, you find answers to the questions you have been looking for. Many times you ask and then do not wait for the answer or do not hear it when it is given. (And it is always given.) This is because you have not taken the time to listen. Our words come through your breath so when you breathe our words are spoken. During this quiet time of breath you may feel a tingling throughout parts of your body. That is your sign to know that we are with you. We have come here to day to let you know that you all have a purpose in coming here in your earthly form. Each time you feel confused, frustrated, tired, cranky, (you get the hint) you are looking your true purpose in the eyes. It is in these times where the greatest lessons can be learned and mastered as well. For if you were to have none of these toxic, as we call them, moments you would not be challenged or have an opportunity to grow. If you have none of these moments may we suggest that for your next go around you choose to stay and help with the work on this end for you will have mastered all you can on the earthly plain. So please check in with yourself during these times of fatigue and make a change so that you will overcome the obstacle. Do you need more rest, more patience, more love toward another, more love toward yourself? Can you be more present when in the presence of others? Whatever the case know that you are in the midst of a lesson and only you can make the change. As you are approaching a new year take this time to honor yourself for all you have done over the past 12 months. This is not done enough to meet our expectations. Every single act is an accomplishment (for you do know you were put on this earth not to do but to BE) and is worthy of praise. We do not notice this being done as frequently as we would like (and as frequently as we honor you, though how would you know this if we were not telling). So please sit and think not of the resolutions you will make over the next year but of the accomplishments you have gained over the last. We know you can get caught up in the lives of others. Is that not why the soap operas you watch are so addicting? It is easier to point fingers at one another but it is almost painful to point the finger at yourself, is it not? Please be diligent in this task not only this month but throughout the year. You will find your life will get a lot more simpler when you are not vested in the outcome of your neighbors. Practice this for all the world to watch, for the world would be a much happier place if this could be done by all. Remember we love you and hold you in the dearest of light. 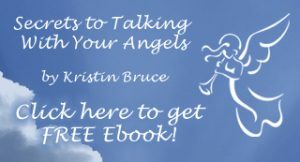 New book by Kristin Bruce now available. The ultimate self-esteem story for young teens. Anyone who has ever experienced self doubt will love how this Angel not only helps Bobby overcome his fear of speaking but manages to overcome her insecurities and earn her wings in the process.